PUMA today released its latest graphic concept football boot, the evoSPEED 1.3 Graphic. Created with dazzling attention to detail, this new boot takes its inspiration from the Japanese dragon, a traditional symbol for speed, power, wisdom and agility. The white, high risk red and sea pine boot will be worn by all PUMA evoSPEED players including Sergio Agüero, Marco Reus, Radamel Falcao, Antoine Griezmann, Marco Verratti, Santi Cazorla and many more. Being a true attention grabber, this new boot features a bold dragon graphic, wrapped around the upper, with its head on the medial side and tail on the lateral side. The boot is emblazoned with a dragon skin textured upper material, applied to the whole boot. The sea pine coloured heel counter and the scaled risk red form stripe, both complete the dragon look. As with every PUMA Speed football boot, the evoSPEED 1.3 Graphic has been designed with speed and agility in mind. A flexible material composition improves the players’ manoeuvrability to react faster. The evoSPEED 1.3 Graphic ensures optimum ball contact and control thanks to PUMA’s GripTex technology on the boot upper, which enhances ball control in all weather conditions. The external midfoot cage which is wrapped around the outside of the boot enhances stability, and a new optimised footbed gives a snug fit to increase comfort. 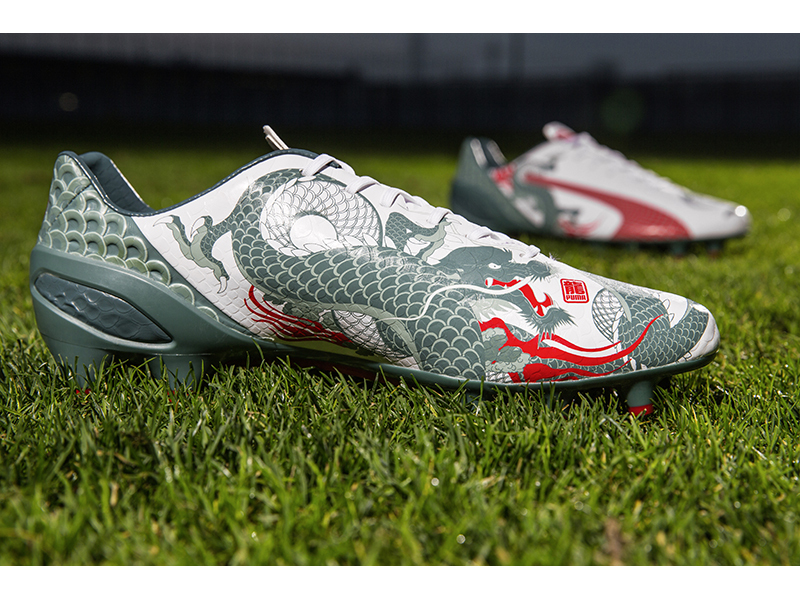 The new white, high risk read and sea pine evoSPEED 1.3 Dragon is available in-store and on puma.com from 1 May 2015. A full collection of training apparel, goalkeeper gloves and other accessories will also be available.